On May 17 SM Caen launched their seat replacement operation. As the Ligue 1 season ended, all 21,000 old seats installed back in 1993 are being removed from Stade Michel d’Ornano. Now the old seats are made available for purchase. First, the city of Caen booked 4,500 of them for the municipal institutions. Now sports clubs from across Normandy are invited to submit their bids for the remaining 16,000+ seats. Smallest ones are priced at €1 (without backrests) while larger ones at €2-3 each. Later the remainder should be made available as souvenirs for fans. Old seats will be replaced by exactly 20,807 new ones. The operation will end before new season commences, in late July. 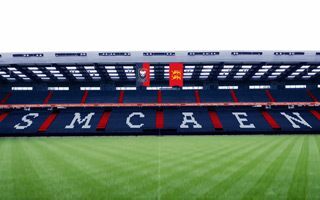 Its outcome will see the whole interior represent club colours of SM Caen, blue seats (with white SM CAEN letters) and red stairs. The price tag on ongoing works is unclear, but the seat replacement is part of a greater rebranding operation by SM Caen. By 2020 the stadium should be thoroughly revamped, while already now the club are using a new crest.